David opted to swap the Worcestershire sauce out for the oyster juice, as it has the same sweet and salty texture; and no true Canadian can resist a fresh oyster. Muddle Iceberg vodka and chili peppers in a mixing glass. Fine strain into a tall glass, rimmed with celery salt. Pour oyster juice out of the shell into the glass. Add ice and fill with Clamato. 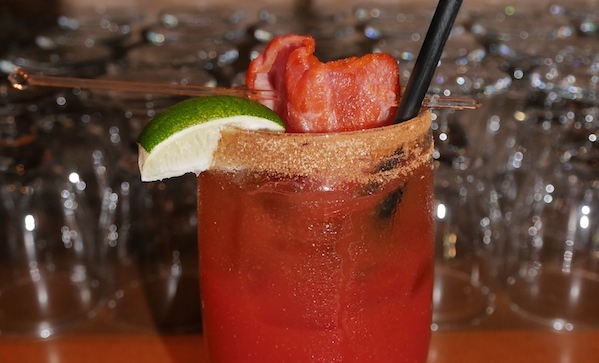 Rim glass with celery salt and crushed bacon. Add Iceberg Vodka, pepper sauce, Worcestershire sauce, garlic salt and BBQ sauce to an ice-filled glass. Pour Clamato on top of ingredients, filling the glass nearly to the top. Garnish with a piece of cooked Canadian back bacon. Rim glass with celery salt and fresh basil. Add all ingredients to a glass with ice, pouring Clamato to the rim. Garnish with a cooked garlic clove, cherry tomato and a spring of rosemary. Serve and enjoy!